Welcome to the JetCJr Homepage. 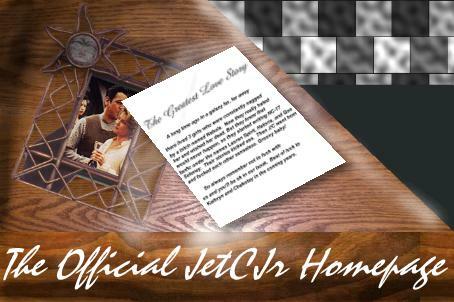 JetCJr is a series of mailing lists for junior fans of Star Trek Voyager and the Janeway/Chakotay relationship, since we're not allowed to join the adult lists. The purpose of the JetCJr webpage is to give our members a place to express their views on J/C and Star Trek Voyager in general. It is also the archive for stories written by members, and has links to members homepages. Voyager may now be finished, but JetCJr is not - quieter, yes, but it's still alive and kicking. We also have a JetCJr Webring so members can join their pages to other members pages; and a Round Robin open to all members - a great way to meet people, write some fanfic and have some fun. If you are a member of JetCJr the you can submit your stories and links to your homepage using the links below. If you are not a member, but would like to be, then hit 'Joining Information' below for information. You can contact us at jetcjr@yahoo.com with any comments, suggestions or requests; praise is also more than welcome ;-) If you have questions JetCJr or the JetCJr webpage, please feel free to e-mail us. This site was created by Cassie and Ashley and is maintained by Laura. Pretty self-explanatory this one; all members of JetCJr are welcome to sign up and join in the fun. For more info and to join go to http://jetcjr.cjb.net/roundrobin or http://groups.yahoo.com/group/JetCJrRR. The Voyager Virtual Season Project is going strong. Some of the great authors this fandom has to offer have contributed to make it such a huge success. If you haven't read any of the episodes yet, then I highly recommend that you do so. Season 8 is over, but a Movie and Season 9 are in production. Feel free to link to this page, using either a text link or the banner above. Please make sure that all links are to http://jetcjr.cjb.net. Would you like to be notified when we update this site? Enter your email address below and hit the button to be added to JetCJrUpdate. Want more info? Try http://groups.yahoo.com/group/JetCJrUpdate. Please vote for us in these site polls. Thanks. Voyager and all recognisable characters are owned by Paramount. No infringements on copyrights is intended. The purpose of this site is for entertainment and no money is made from the site. The site is not endorsed by Paramount and has no links with Paramount or any of the writers or actors.